By James Passantino I’ve done a lot of stupid and dangerous stuff in my life, I’ve admitted this much before in pubic. I got myself hit with tear gas while involved in student riots in Quito, Ecuador while I was neither a student nor a citizen of said country just to take pictures (which were subsequently stolen), jumped out of perfectly good airplanes (landed on a parked mini-van my 5th jump), and once even dove into chum filled waters 10 miles off the eastern seaboard while shark-fishing because the waves and blood made were making me nauseous. And these examples are only things I will admit to, there have been many more accusations made that I will not confirm or deny. Given my proclivity for stupid decisions, I am not exactly sure where this next story ranks, but given that it happened so recently and I should have known better, it should rank high. The thing that I feel really stupid about is the fact that I have sat in on Christine William’s lecture on dangers in the aquarium. I payed attention, found it fascinating… and then ignored what I heard. It started as a benevolent idea to spread some frags around to fellow reefers (and an excuse to play with power tools). A friend, I will call him Omar (real names are not being protected), had recently purchased a new dremel and wanted to test it out so we opened a bottle of scotch and took an extra large palythoa colony out of my refugium. I am not going to list the mistakes that were made, they should be evident. What followed next was completely avoidable. With no gloves, in a room with very poor ventilation, we went to town on this colony. It was on a rock about 8 inches in diameter and circular in shape. The palys were covering the entire portion of the rock that wasn’t resting on the bottom of the sump. The dremmel started and within seconds the room started getting a white misted mix of rock and coral. My wife retreated to the shower complaining of the mess we were making. Omar continued to cut the rock as I took pictures, drank scotch and yelled words of encouragement over the sound of the diamond blade slicing through the colony. I assured Omar that the white mist was ‘just calcium’ as we started to get the metallic taste in our mouths. My scotch-soaked brain started remembering about palytoxins. I took solace in the fact we weren’t dead after 10 minutes of cutting. One of Omar’s eyes started getting red due to something flying in it. We were both coughing a bit from all the ‘calcium’ in the air. After about 20 minutes Omar went back to his place and I called him to make sure he was alright. He said he felt decent but his eye and throat were bothering him and he had the same metallic taste in his mouth that I did, he said he was going to go to bed and sleep it off. This was at around 12 A.M. I awoke to my cell phone ringing at around 5 A.M. thinking it was a co-worker calling to tell me there was no school (this was one of the mornings of a big NYC snowstorm); unfortunately it was Omar informing me that he just woke up with a severe fever and horrible chills. I told him to call 911 and get an ambulance ride to the hospital immediately. As I started to wake up I realized that I was short of breath and felt like I had a chest cold. I am not sure if this was from the palytoxin or all the particles of rock that I surely breathed in. After Omar got to the hospital they stuck him in the ER waiting room before they took his temperature thinking it was the flu. He told them several times it was palytoxin poisoning but they didn’t pay attention until he had an outburst and demanded to be checked. A nurse checked his temperature and it was 104.something (I forgot the number he told me). They put him into an isolation room and got in touch with doctors from the CDC and the infectious disease department at Bellevue Hospital in Manhattan. 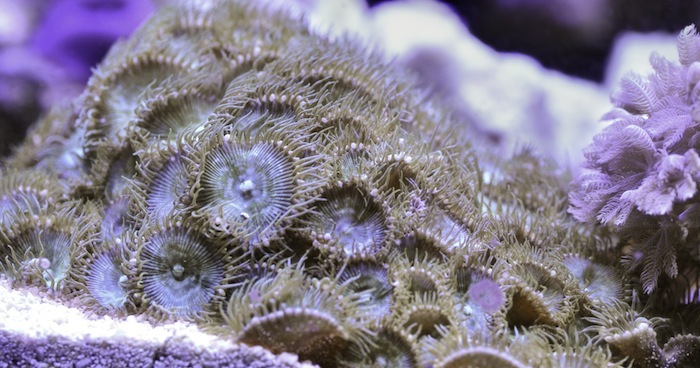 The doctors ran a battery of tests for the flu and other things before finally diagnosing what we knew all along, palytoxin poisoning. He stayed in the hospital until the early evening. I cannot imagine how scared he must have been in that isolation room with a high fever and I cannot describe how scared/guilty I felt as the person responsible for this fiasco due to my very poor decision making. Omar got home after a very long day and all was well. In the end, the frags were fine. They were given away as “killer” palys (a bit of hyperbole in this case but certainly not a stretch) to some members of my local club. The ironic part of all of this is that I had a delivery of gloves and full surgical masks arrive the day this all happened. If we would have been patient and waited 24 hours it is quite possible none of this would have happened. 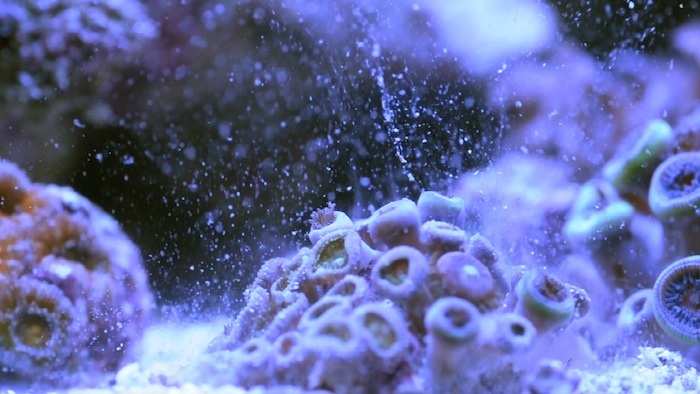 I implore anyone who reads this and thinks it will not happen to them to please use proper protection (gloves and masks) and make sure you are in a well ventilated room when fragging zoanthids or palythoas. Use gloves when you are messing with your tank and please do not think that this cannot happen to you, I thought that way and was fine for 11 years until I got my friend stuck in the hospital.